sf.citi is excited to announce the start of our student-authored blog series by current Future Grads interning at companies and organizations throughout the city. Going on its seventh year, Future Grads connects San Francisco’s current and future workforce by offering local high school students fully paid summer internships at sf.citi member companies and partner organizations. While enthusiasm for Future Grads grows every year—the program has nearly tripled in size since its founding—what better way to understand the true value of Future Grads than by hearing from the students themselves? 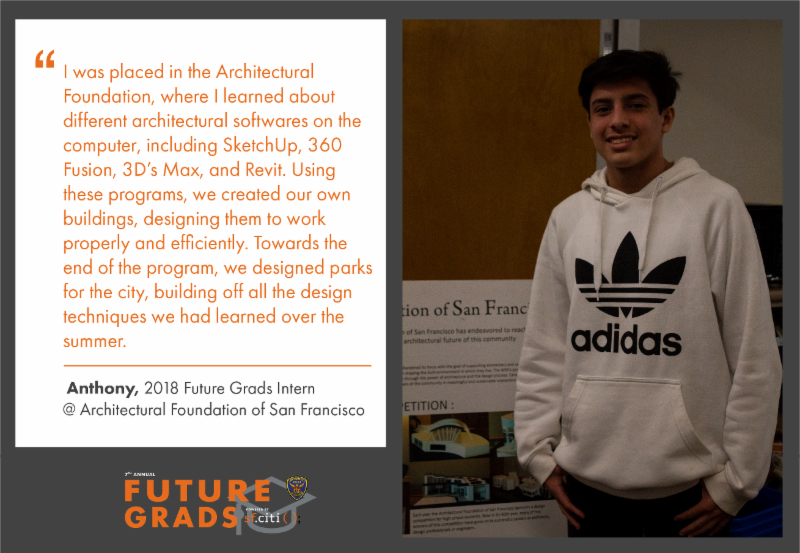 First in our student lineup, Anthony Martinez, a rising senior Archbishop Riordan High School, tells us about his internship experience at the Architectural Foundation of San Francisco. As a two-time Future Grads participant, Anthony shares some of what he’s learned, plus a bit of advice for the next gen of Future Grads hoping to make the most of their experience. Feeling inspired to help other young people like Anthony get a head-start on their career? Become an sf.citi member today and sign-up for Future Grads! sf.citi held its second two-part Lunch and Learn at sf.citi member company Postmates. 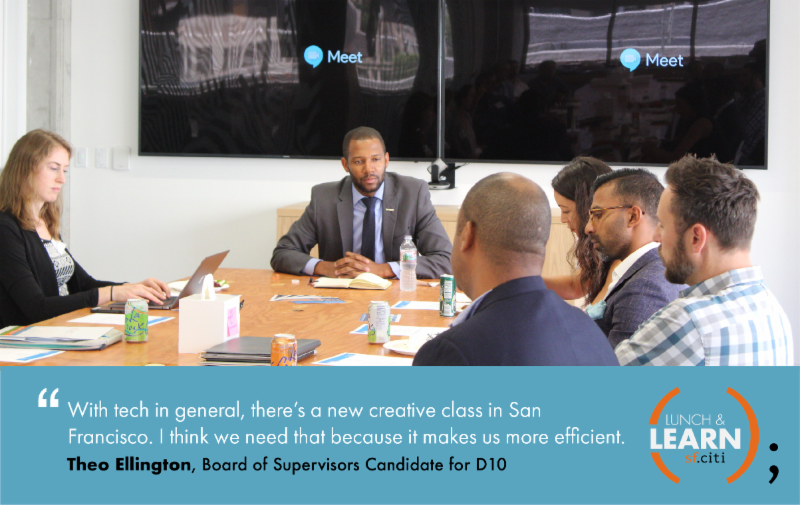 Joined by representatives from Cruise, Dropbox, Verizon and other sf.citi members, we first heard from District 10 Board of Supervisors candidate Theo Ellington. “I am proof that technology can be used to lift people out of poverty,” said Ellington as he described growing up in San Francisco’s Bayview neighborhood and passing the shrines of gun violence victims on his walk to middle school. In Bayview, Ellington also uncovered a love for visual storytelling when he took a filmmaking class—funded by Salesforce CEO Marc Benioff—at his local arts center. Currently serving on the city’s Human Rights Commission, Ellington said he hopes to change a common narrative in San Francisco of pitting one side against the other. He described himself as a staunchly pro-housing candidate who believes building housing goes hand-in-hand with building community and alleviating homelessness. Question for the candidate: For tech companies in San Francisco, what does it mean to be a good neighbor? Ellington called San Francisco’s tech community the new “creative class,” alluding to the city’s long history of housing artistic and innovative thinkers. He also emphasized tech’s responsibility to “be responsive to people who live here in San Francisco” and to “help the overall system work better.” On this, he encouraged tech workers to get more involved with their local community. In terms of tackling San Francisco’s most pressing issues, Josefowitz advocated a data-driven approach that uses “modern technology to make our government run smarter and faster.” He pointed to the example of homelessness in San Francisco, which, he said, is exacerbated by a lack of shelter beds and limited data on the effectiveness of city-funded homelessness services. 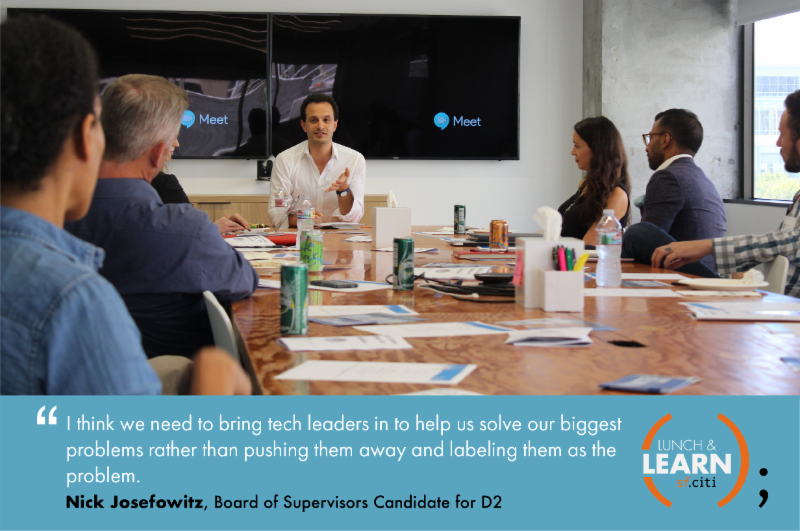 Josefowitz asks tech: What’s the biggest issues for the Board of Supervisors that you see as big employers? Near the end of the discussion, Josefowitz floated this question to the room and heard various members express the need to address San Francisco issues at the regional level, in addition to the local level. In response, Josefowitz said he would draw on his BART Board experience to use “all the tools available, including at the state level” to change the “deeply parochial” culture of San Francisco politics. Many more Lunch and Learn discussions to come in the lead-up to the November election. If you want the chance to speak candidly with San Francisco elected officials and candidates, become an sf.citi member today! A pending proposal to ban future (not current) employee-only cafeterias is quickly making the rounds on slack channels and around the water cooler. Sponsored by Supervisors Safai and Peskin, the bill’s defenders argue that dine-in options are bad for local business while those on the other side point out that private cafeterias employ many local workers. Read more about the pending ordinance here and mixed reactions here.